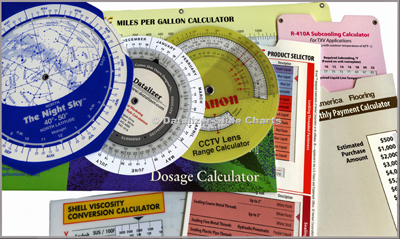 For over 60 years, Datalizer Slide Charts has specialized in the design and production of custom Slide Charts, Data Wheel Charts and Slide Rule Calculators. Our technical and creative staff is the most experienced in the industry. We draw on that experience, and on our extensive archive of previously produced charts, when developing new Slide Chart solutions. We have perfected the processes and equipment necessary to produce top quality products. From light-weight folded paperboard to rigid plastic, we can manufacture products that will meet your requirements... and your budget. Whether you require custom printing, specialized diecutting or high speed manufacturing, Datalizer can handle your project... from start to finish. Our American made Slide Charts are developed and manufactured in our specialized facility in Addison, Illinois.